The Angled Foregrip Small is a slimmer version of the regular Angled Foregrip. This reduced size allows for better mounting on a wider range of railed hand guards, and better compatibility with rail covers and accessory mounts. 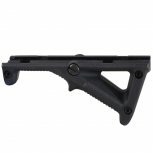 The Angled Foregrip Small is compatible with 1913 Picatinny rails. The ergonomic design complements natural body mechanics to provide a comfortable grip for your gun's hand guard, reducing fatigue, and allowing for more precise shooting control. Perfect for the scenario player looking to simulate that real steel look of modern weapons. Mounted this on my Phenom X7. I have a couple of different shrouds for this gun. The under grip was a little long for my original shroud but it fits perfectly on the MP5 shroud. Provides a great natural hand position and makes the gun easier to handle especially if you are using a longer barrel like and APEX. Just gives you a solid grip on the front of the gun. When I got it I figured it would basically just look cool but honestly I was surprised at how much of a difference it made when you are moving around with the gun.